Ms. Marvel and Squirrel Girl Team Up with America, Inferno and Patriot in MARVEL RISING! For the first time ever, Ms. Marvel, Squirrel Girl, America, Inferno and Patriot are teaming up for a brand-new epic tale featuring the next generation of Marvel super heroes. Building on the recently announced multi-platform franchise MARVEL RISING, readers will find a thrilling new comic book mini event kicking off this spring in a special FREE #0 issue! The all-new story begins when Doreen Green and Kamala Khan take on a Marvel Universe mission this April in MARVEL RISING #0, just ahead of Free Comic Book Day. The two heroes will meet for the first time in a twist of fate, discovering each other’s secret identities in a classic superhero first meeting story that follows Marvel’s long history of monumental team-ups! Featuring art by Marco Failla (Ms. Marvel), issue #0 will be written by Devin Grayson (Power Pack, Ghost Rider), who will be joined for future stories by Ms. Marvel writer G. Willow Wilson and Unbeatable Squirrel Girl writer Ryan North. 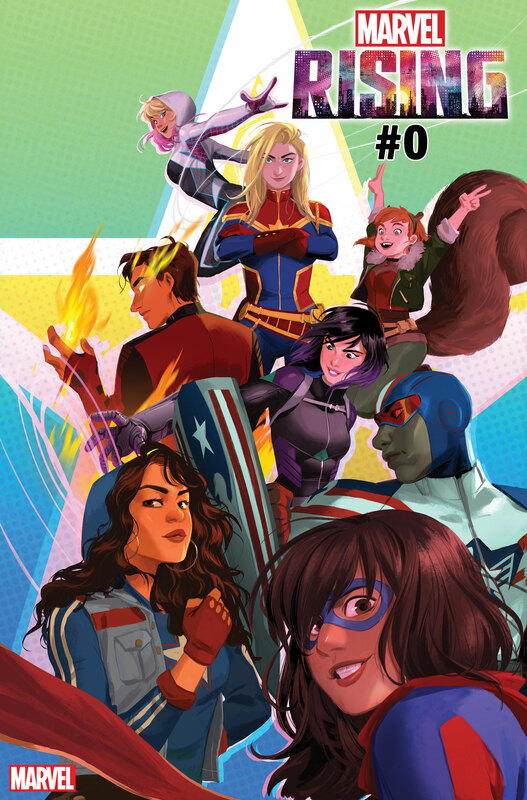 Retailers will receive FREE copies MARVEL RISING #0 in April. Then, in June, the story continues with an epic tale that launches with a special issue tied to a Father’s Day event in local comic shops. MARVEL RISING, a multi-platform franchise starring the next generation of Marvel heroes, kicks off in 2018 encompassing a wide array of content. Marvel Rising’s comic book mini event, beginning this April with the Free MARVEL RISING #0, is designed to drive new audiences to comic shops while leveraging the franchise’s multi-platform program. MARVEL RISING: SECRET WARRIORS will debut later this year and feature six four-minute digital shorts followed by an animated feature. Just what does it take to be a young super hero in the Marvel Universe? Join Ms. Marvel, Squirrel Girl, America, Inferno, and Patriot in this all-new story, featuring a generation of heroes who will rise together and change the world! It all starts this April, when the FREE issue of MARVEL RISING #0 hits comic shops!